BE AWARE THAT THIS BUNDLE CONTAINS THE EXAM WHICH IS ALSO LISTED SEPARATELY IN MY STORE. 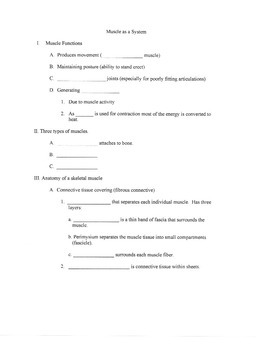 This bundle contains guided notes for the Human Anatomy and Physiology Presentation on Muscle and the Sliding Filament Theory. 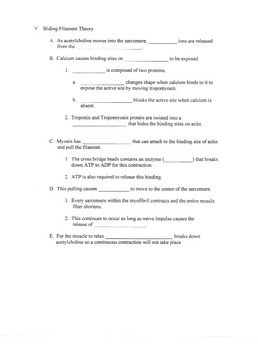 Included are guided notes, two quizzes (one as a make up quiz). There are no lesson plans in this bundle. 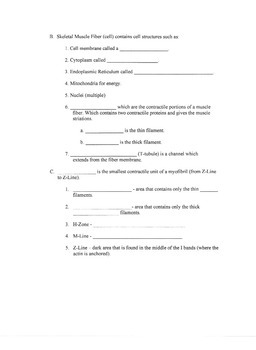 I have added an exam that contains 31 multiple choice items and one open response item. The key and rubric is also included. My students use the Anatomy Coloring Book by Kapit and Elson. I am including this under the higher education level because I've had several students dual enrolled at local community colleges who stated we covered the same material. The time frame for this lesson is based on a high school 4x4 schedule.